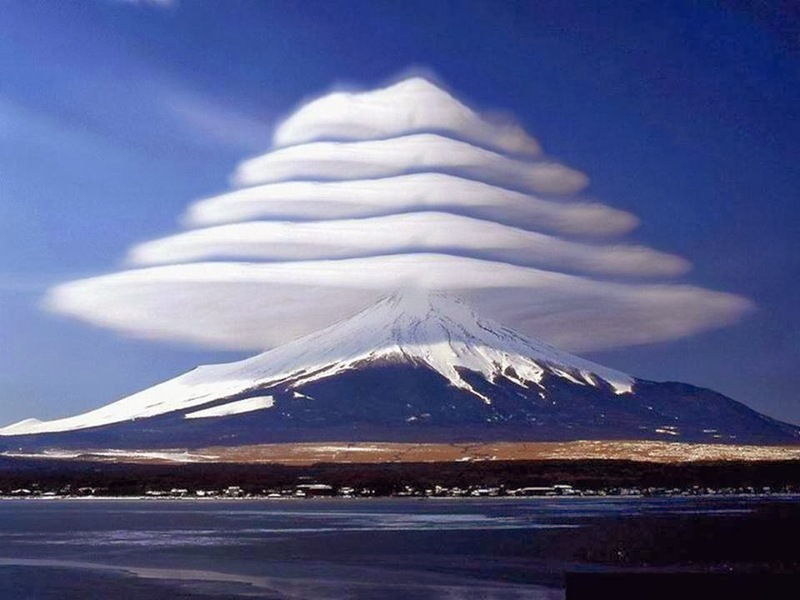 Home » clouds » japan » mountain » nature » Lenticular Clouds over Mount Fuji! Mt Fuji is the highest mountain in Japan. The mountain has a base diameter of 50 km. Fuji Volcano consists of three volcanoes: Komitake, Ko-Fuji (Older Fuji Volcano) and the present Fuji (Younger Fuji Volcano). A summit crater is 500 m across and 250 m deep. More than 200,000 people climb to the top of the mountain every year. There was an increase in seismic activity under Mt Fuji in 2000-01. A new eruption of Mount Fuji may be explosive like the 1707 eruption. A 2004 Japanese government simulation determined that in the worst-case scenario, a major eruption of Fuji would cause ¥2.5 trillion in economic damage. Mt Fuji is privately owned above the eighth station. Fujisan Hongu Sengentaisha, a Shizuoka-based Shinto shrine, was granted the land in 1609. The Philippine Tectonic Plate, the Eurasian Plate (or the Amurian Plate), and the North American (or Okhotsk Plate) meet at Mount Fuji. A large, shallow earthquake (mag 6.2) occurred under the SSW flank of Mt Fuji on 15th March 2011. On 26th October 1707 there was a magnitude 8.4 earthquake hit Honshu, Japan. This was followed by several smaller earthquakes around Mt Fuji. An eruption began on 16th December 1707 on the SE flank of the volcano accompanied by pumice fall. After 6 hours the pumice fall changed to scoria fall. On the first day of the eruption, 72 houses and three Buddhist temples were destroyed in the town of Subassiri 10 km from the volcano. Violent eruptions were recorded between 25-27 December. The eruption ended on 1st January 1708. No pyroclastic flows or lava flows were formed during the eruption. Tephra from the 1707 eruption fell over the south Kanto plain, Tokyo, and NW Pacific ocean 280 km from the volcano. The total volume erupted over 16 days was 0.68 cubic km of dense rock equivalent. March 2011, scientists have been anxiously watching the massive volcano known as Mt Fuji for signs of activity. In September of last year, a report was released stating that Mt Fuji’s magma chamber pressure had risen to a worrisome 1.6 megapascals, which is estimated to be higher than when it last erupted. According to retired professor Masaki Kimura of Ryukyu University, this and other recent phenomena indicate an eruption of Mt Fuji should have taken place in 2011 with a four-year margin of error ending in 2015. First, a little background on Mt Fuji. Japan sits on the edge of a “subduction zone” which is where one layer of the Earth’s crust is pushed under another. This pushing is an ongoing process and results in part of the Earth’s crust being pushed down into the hot magma of the Earth’s mantle. However, because this crust is saturated with water, it mixes differently with the magma in the mantle causing a lighter material to rise back up through the top layer of crust. This rising magma then becomes a magma chamber. Here, away from the mantle, various gases are released from the magma and accumulate. When pressure becomes stronger than the rock containing it, the rock pops open in a volcanic eruption. Mt Fuji was formed in this manner, and the subduction which occurs during large-scale earthquakes is believed to cause an increase in the magma chamber. The previous 1707 eruption of Mt Fuji is said to have been triggered by a massive earthquake occurring near Osaka a month before. Prof Kimura believes that aside from the Tohoku earthquake there has been an overall increase in more “normal” seismic activity around the mountain – particularly on its northeast side. By “things hanging”, Prof Kimura is possibly alluding to the partial collapse of the Sasago expressway tunnel in December last year, which killed nine. Authorities are still investigating the cause of the collapse and no earthquake was detected at the time, but deformation of the tunnel is speculated as being the cause. Prof Kimura also mentions the rise of the water level at Lake Sai which is located to the northeast of Mt Fuji. At the time of the Tohoku earthquake, the lake’s water-level rose by one meter. Kimura believes that this was caused by the permafrost near Fuji’s summit melted by rising magma. Prof Kimura also claims that there have been a large number of phreatic eruptions – explosions of steam caused by heating of ground water from rising magma – around the mountain. No lava is released during these explosions, only water and rock. However, some say that phreatic eruptions are precursors to major volcanic eruptions. Prior to the 1980 eruption of Mt Saint Helens in the US, there were numerous reports of phreatic eruptions. This is a theory which Prof. Kimura seems to agree with. It should be noted that Prof Kimura is co-author of “Fujisan No Funka Wa Hajimatteiru!” (The Eruption of Mt Fuji Has Begun! ), a book released in June last year, as well as author of 2011’s “Fujisan Dai Funka! Bukimina Itsutsu No Choko” (Mt Fuji’s Big Eruption! Five Eerie Signs). Also, despite the evidence at hand it is still difficult to predict disasters like earthquakes and volcanic eruptions with absolute accuracy. However, in the event of a Mt Fuji eruption, many speculate the cost to human life would be low due to the slow moving lava that would likely occur. On the other hand, the cost of damage to public and private property would undoubtedly be immense.